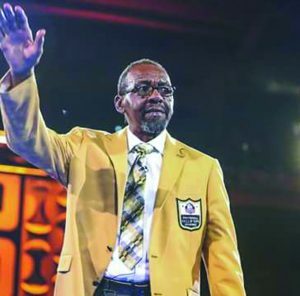 Nearly three decades after retiring from the NFL, former Seattle Seahawks Strong Safety Kenny Easley was one of seven members of the 2017 Inductees into the NFL Hall of Fame in Canton, Ohio. During his acceptance speech, Easley, as did the other honorees, spoke of his appreciation for the people who helped developed him as a person, player, and his career in the NFL. But Easley also took time to speak about the issue of police violence toward African-Americans. He did not mention Colin Kaepernick by name, but his words resonated with the Quarterback’s protest against police shootings of African-Americans, expressed by Kaepernick’s kneeling during the national anthem before games. Kaepernick still has not found a job in the NFL after being let go by the San Francisco, 49ers, although quarterbacks of lesser skills have been signed. Black activists say that he is being “Blackballed” by the league for his efforts. Easley, who was born in Chesapeake, Virginia, has played at UCLA and with the Seahawks from 1981 to 1989. Other members of the 2017 NFL Hall of Fame Class are Jerry Jones, the Owner of the Dallas Cowboys; former Dolphin Player Jason Taylor; former Kicker, Morten Anderson; Broncos Running Back, Terrell Owens; Charger Running Back Ladaianian Tomlinson; and St. Louis Quarterback Kurt Warner.